Last week we had a box of nectarines that were getting rather over-ripe. This always seems to happen in our house, we buy fruit and then have to wait for it to ripen and promptly forget about it until it’s more than ready for eating, which then generally leads to banana bread, crumble or baked nectarines. This time though I thought I’d try something a little different with them and kill two birds with one stone by using up the leftover puff pastry that was sitting in the fridge. Now I normally have really bad luck with pastry, I never seem to get the cooking times or temperature right so it either doesn’t cook fully on the inside but looks lovely and golden on the outside or is a little burnt and just about ok. After having had success making bear claws the other week with my sister I thought maybe my luck was changing, so decided to give pastry another go. 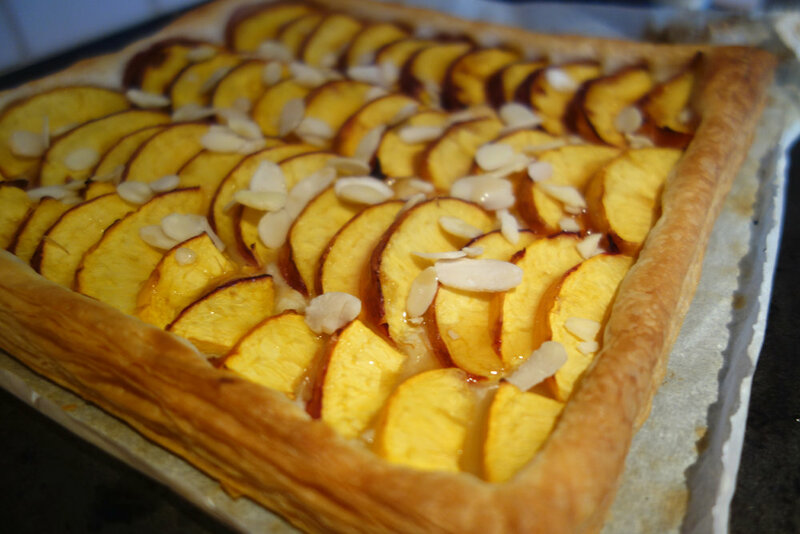 Luckily this nectarine puff pastry tart was a nice thin layer of pastry with the nectarine slices lined up on top, so not too many layers of pastry to deal with. I popped it in the oven and continued to check it by doing my best bake-off impression- staring through the oven door in an effort to make sure it didn’t burn. It turned out great, the pastry was cooked all the way through and had no soggy bottom despite the juices from the fruit. Hurrah! Finally friends with pastry! It smelt delicious and Robert was looking forward to giving it a try. That was until I managed to dramatically throw it on the floor. Now our kitchen is pretty small, and we don’t have much work surface space, so I’d put the baking sheet on the hob, but being the klutz that I am I managed to knock it. I could see it all happening but wasn’t able to save it, and of course it falls nectarine side down, totally unsalvageable. That wonderfully (probably an overstatement) cooked puff pastry was in flakes all over the floor which (*insert sarcasm*) was such fun to clear up. Luckily, I didn’t freak out over it and instead consoled myself with a spoonful of Nutella (yum) and had a laugh with Robert about my clumsy nature. We still had some nectarines left and pastry in the freezer so I gave it another shot on Saturday to round off our delicious enchilada meal that Steve had made. On a side note, I think Mexican might be one of my favourites, you just can’t go wrong with guacamole. Luckily this time I didn’t throw it on the floor and instead topped it with flaked almonds and a drizzle of maple syrup. Using ready-made puff pastry made it such a quick dish to make and there are so many variations you can do, I’ve seen one where you spread custard on the pastry first which sounds pretty awesome.